AUGUSTA, Ga. – Tyson Reeder finished third and Mason Overstreet eighth and the Arkansas men’s golf program shot a final-round, even-par 288 to place fourth with a total of 845 (277-280-288) at the 15-team Augusta Haskins Award Invitational, played at Forest Hills Golf Club (par 72, 7,005-yards). Reeder’s third-place finish was his career-best and his second career top 10. He also posted career bests with a 54-hole score of 207 (64-70-73) and finishing 9-under par. In the final round, the junior was 4-over through 16 holes but rallied to finish eagle-birdie to card his 73 Sunday and third-place finish. Reeder’s 14 birdies over 54 holes were the third-best total in the field and his most over 54 holes in his career. Reeder additionally carded his team-best, fourth eagle of the season. Overstreet was steady throughout the final round, recording 14 pars, a bogey and three birdies to post a 2-under-par 70. With his final-round performance, Overstreet moved up four spots to finish in a tie for eighth with a total of 210 (74-66-70). The junior now has 12 rounds of par or better this season with three top 10 finishes. The junior finished with 36 pars over 54 holes, the sixth-best total in the field and his second-best total of the season. Overstreet also had 12 birdies, tying for his second-best total of the season. Wake Forest, ranked third nationally, won the team title with a score of 828, #19 South Carolina (831), #7 Texas (834), #37 Arkansas (845) and Notre Dame (853). 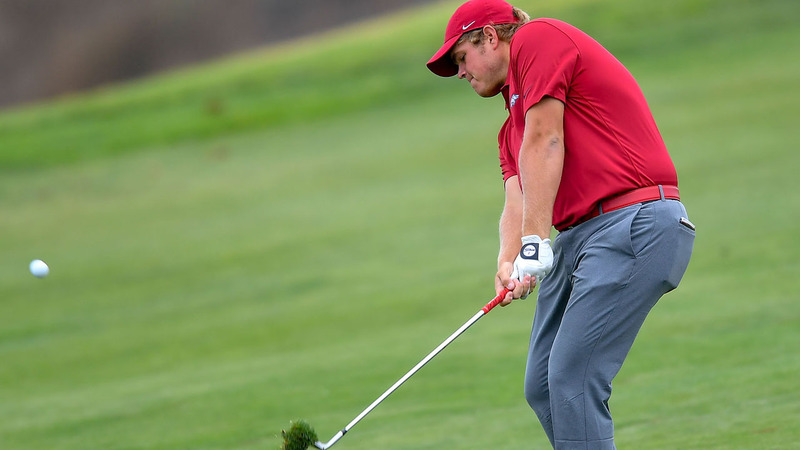 The Razorback score in relation to par (-19) at Augusta is the program’s best of the season and the score of 845 is the best of the spring as the team closes the regular season and will begin preparing for the 2019 SEC Championship, played April 24-28. Julian Perico finished in a tie for 33rd, shooting an even-par 216 (70-73-73). He started slowly in the final round with three bogeys and a birdie through five holes. However, he closed the day with 12 pars and a birdie for his 73. William Buhl tied for 39th with a 54-hole total of 218 (72-71-75). Luis Garza jumped nine spots on the leaderboard after a final-round 72, finishing in a tie for 42nd with a total of 219 (71-76-72). Garza off-set two bogeys with two birdies to post his even-par round. Forest Hills Golf Club • Augusta Ga.